The books get hotter in July! This month we have three new releases including a young adult by Lyn McConchie! Sir William de Clopton has joined crusaders to defend the city of Smyrna in Anatolia. Upon arrival, he discovers that Tamir the Lame has come to destroy the city and with it all the crusaders. So fearsome is his reputation that the Muslims flee the city. Can a thousand warriors hold back tens of thousands that siege the city? Only 99 cents! 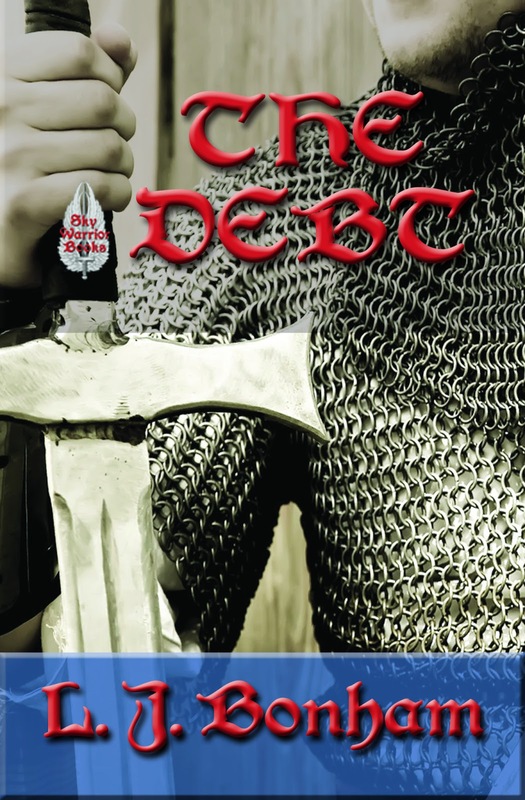 Buy The Debt on Amazon Only! 8. Cliche or overused plot lines. Believe it or not, coming to a weird and wild planet and discovering it is Earth isn't new or fresh. Discovering that the aliens are us isn't a surprise. Nor having a man and woman become Adam and Eve to populate earth is new either. And despite being guilty of this, I can say that having the foretold hero come from a farmhand to save the universe can be a bit too formulaic if it's not done in a fresh manner (can anyone say Star Wars?) Oh and getting pregnant and giving birth to an alien baby is right out--unless the plot doesn't revolve around it. 9. "As you know, Bob..." Explaining technology to characters who should know it is the quickest way to cause a rejection slip flung in your direction. Called "As you know, Bob...", an author tries to avoid the infodump by having two characters talk about it. 10. Passive Voice. If there is one thing that will cause me to scream at a manuscript, it's passive voice. Don't know what that is? Learn. Active: "Jeff threw the ball." Subject-verb-object. 11. Inconsistent POV or Head-Hopping. Inconsistent point of view where the readers have to guess whose head they're in now is sloppy and annoying. Stick with the correct POV, whether it's third limited, first limited or multiple third limited. If you switch POVs, change to a different section. 12. Wordiness. Falling in love with your writing and not getting rid of the extraneous words will make me groan. Pick up a copy of Ken Rand's book, The 10% Solution , and follow it verbatim. It's a cheap and fast read and will make your writing so much better. 13. Getting Your Facts Wrong. Don't cheat on your facts. Someone who knows something will be more than happy to point out the error of your ways. You can't know everything--research and ask people who do know. For example: don't write about horses unless you know about them or can find out about them. They are not cars with hooves, nor are they giant puppies. 14. Flat and Unsympathetic Characters. Characters need to have personalities and must behave within their character. People aren't the same--they have quirks and personalities as well as a desire for something. Their motivations and desires drive the plot. If your characters are looking too much alike, then you need to reassess them. Furthermore, characters need to change and grow, just as people change and grow. Your character must be a different person at the end of the book than at the beginning. Likewise, the unsympathetic character doesn't win me over either. Your character needs to have a likeable or sympathetic trait that I can latch onto and say that there is some redemption. At the same time, the quickest way to turned me off is to have a whiny, sniveling character who won't do anything. The character can't be a victim but he or she can't be a bully, unless you're looking to have him or her change. I hope these have been helpful to you. These aren't the only reasons why your work was rejected, but they are some of the most common that I see. Good luck and happy writing!